Before entering Honduras all I knew about the country was that it is the murder capital of the world. 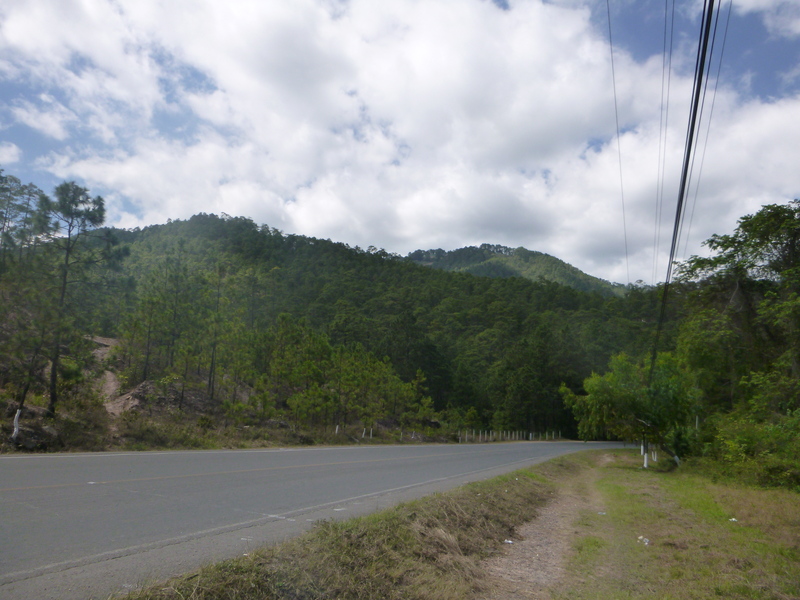 However, to get to Nicaragua I needed to pass through the ominous Honduras. Getting on my bus I planned to get to Nicaragua fairly quickly. However, on entering Honduras I soon realised regardless of it’s bad name the country was stunning. We drove across gorgeous, green, forested mountains, passed crystal clear flowing rivers and saw beautifully colourful native plants. The hills rolled on for miles and looked so dramatic against the bright blue sky. After such a positive stay in La Ceiba I decided to stop in one more place in Honduras before crossing the border to Nicaragua. A couple of local people had mentioned Calle de Angeles – so I made my way there. I was fortunate enough to sit next to a friendly old man on the 8 hours bus ride. He spoke to me about his daughters, one of which was my age. Later on he offered me to use one of his headphones to listen to some 80’s American music. He had some great cheesy tunes. Each stop we made he told me the name of the area and then in arriving in the capital – Tegucigalpa, he hailed me a taxi and away I went to find the next bus stop. I had heard that the capital was nothing special and rather dangerous. Looking out of the taxi window, I saw a pretty run down capital city. American chain stores polluted the grey streets, traffic jams were prominent everywhere and sparse trees cropped up from time to time. I was pleased not to be staying there long. My final bus to Calle de Angeles was perfect. While, it was a local bus it was in good condition and had proper seats. This last leg of the journey was delightful, the strong sun was beginning to set over Honduras, casting shadows on the vast forested mountains. The sky was a pinky blue. Passengers began to get off the bus and as per usual I had not booked a hostel so I kept my eyes peeled for one. We passed the town park and I asked the driver where the hostels were. He dropped me off right outside one – perfect. As I entered it looked like a decent option. I was delighted to find that the showers had hot water – a true luxury. There was no WiFi but I had hot water – I could not believe my luck. I went for a typical Honduras dinner – meat, rice, beans, salsa, cheese, avocado and of course tortillas. It was fairly nice, nothing too outstanding. Calle de Angeles seemed like a pleasant, safe and comfortable place to be. The next morning, I went to the lovely town park a five minute walk from the hostel. Here there was free unlimited, rather slow WiFi. While, sitting down a friendly Canadian missionary approached me and gave me some top tips about the area. Following this guidance I went to a beautiful cafe, with a terrace overlooking the mountains for breakfast. It was a fantastic spot – where apparently the prime minister used to dine. Next, I decided to go for a hiking adventure. 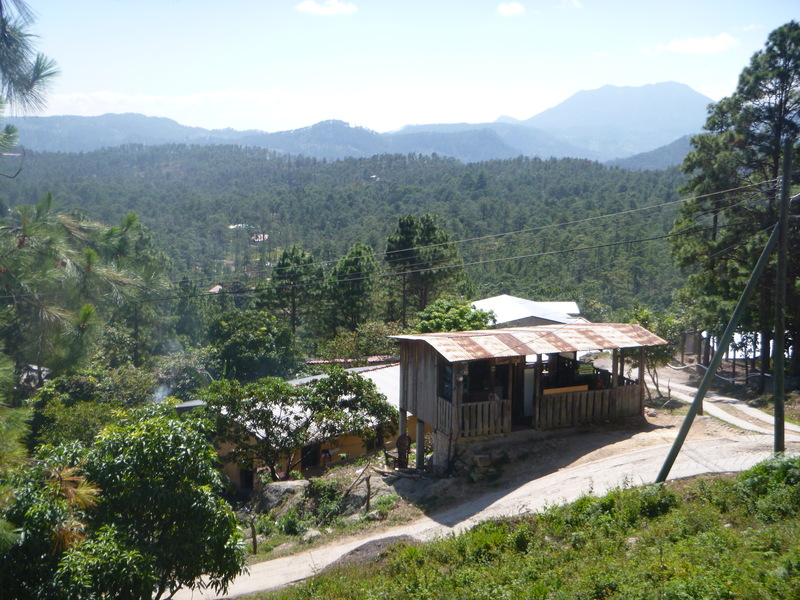 I had been told not to go on any mountain trails alone, which was fair enough given the crime statistics in Honduras. So instead I walked along the safe main road gazing at the mountains. I followed a dirt road through a safe neighbourhood viewing more stunning views. I passed an area being logged, which saddened me. However, the surrounding view was still so stunning. I returned to the beautiful town centre for a late lunch. I tried the typical anafres dish. 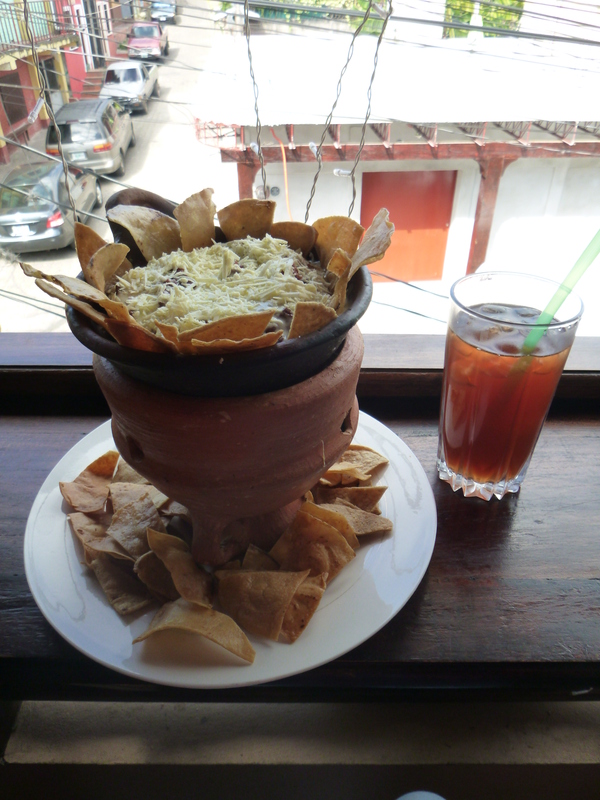 It was refried beans topped with cheese which you dipped tortilla chips in. Again it was okay, I think I’m getting a bit sick of the beans and strange tasting cheese but when in each place I always try to order the typical food. I think I might try and find something a bit different for my next meal. That afternoon I roamed around the lovely, colonial, colourful streets browsing in the numerous souvenir shops and having a little explore. I sat in the park again for a while and while chatting away on the phone an adorable little boy came up to me. His family were sitting around on another bench. I thought he wanted to make friends but what he really wanted was the listen to music on my phone and then to keep my phone. I told him I was sorry, showed him how broken my phone was and he left. I was very happy to have made the stop in the beautiful Calle de Angeles. It was a perfect place to stay. Now I am on route to Nicaragua.